Are you ready for another day of My Creative Time sneak peeks? Today we have another great new die set to share with you! It's called More Scalloped Stitched Ovals, and it includes 8 oval dies, alternating scallops and regular! This will be a very fun and useful set to use! For my card today, I took one of the regular ovals, along with the scalloped oval that is just bigger than it, and I ran them through my Vagabond to make a pretty frame. 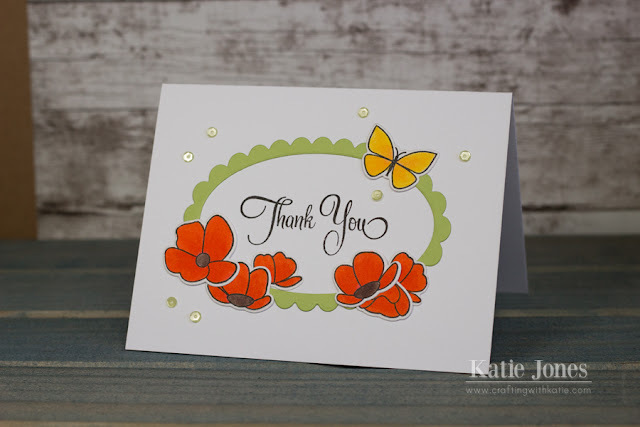 I then embellished the frame with lots of pretty poppies and a butterfly that I made with the A Beautiful Day stamp and die set, coloring them with my Zig Clean Color Real Brush Pens. The sentiment is from Floral Sentiments - Revised. Some Pretty Pink Posh sequins finished off this card! Oh Miss Katie What a Gorgeous Card!! Loving the way you used the new oval dies you so showcased it with your beautiful flowers & darling butterfly. Love the colors and the sweet touches of embellishing you did. You so did a Super Outstanding Creative job!! YOU so ROCK!! Really pretty card! I'm really excited about the new stitched ovals! Woo hoo! Love your card! So pretty with the butterfly and flowers! This new die set is awesome! I love that card! Such pretty colors and the flowers are beautiful. I love this new oval die set. Your card is so pretty, great job! and I'm loving the new dies this month. Great idea ... Beautiful card. Your card is so pretty! I love the bright poppies and butterfly and how the new ovals set off the sentiment and card design! Beautiful job. Sweet card design. I like the colors. I am always looking for new ideas to use to make a thank you card. I really like the orange flowers. It is simple to make but yet so pretty. This is so sweet! I can't wait to lift it. Beautiful Card! So bright and cheerful. Showcases the new dies fabulously. Pretty flowers and butterfly! Love the More Scalloped Stitched Ovals set! Layering them makes such a nice frame for the image or sentiment! Beautiful color combo on your card! MCT Whatever Wednesday with a VIDEO! MCT 68th Edition Release Blog Hop & Sale!